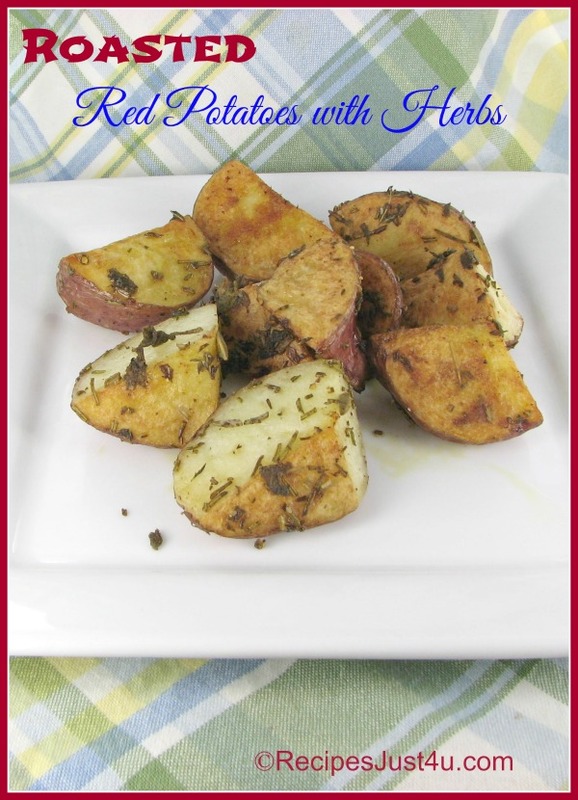 This recipe for roasted red potatoes with fresh herbs is easy and very tasty. 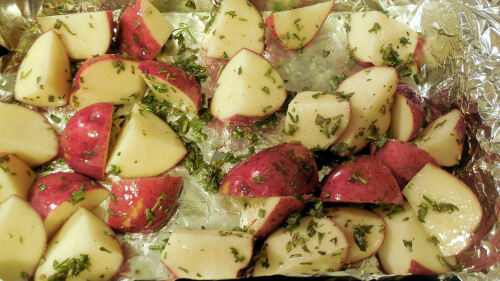 The potatoes are just lightly coated with a bit of olive oil and some fresh herbs and then roasted in a hot oven. The result of roasting potatoes is that are crispy on the outside and have a tender inside. So much better for you than french fries and so tasty from the mix of olive oil and herbs. about 3 tbsp of fresh herbs. I always use extra. Today I used rosemary, thyme and sage, but any fresh herbs will work well. The recipe could not be easier. First preheat the oven to 425º F. Cut the potatoes into large chunks and place in a large baking dish lined with aluminum foil. 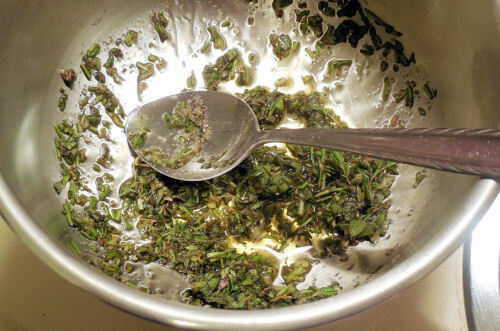 Chop the fresh herbs finely and add to a large bowl. Stir in the olive oil and salt and pepper. (I don’t use much of either. Dump the oil/herb mix into the potatoes and mix well using your hands being sure the potatoes are well coated and the herbs well mixed throughout. Place in the preheated oven and roast for about an hour, stirring every 20 minutes for best results. Serve immediately. Be careful – the insides of the potatoes are very hot! 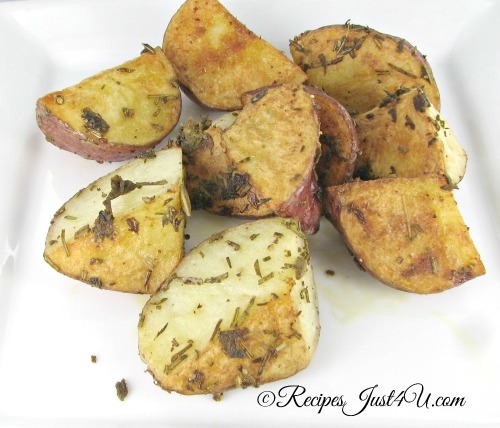 These roasted red potatoes have a crispy outside and warm and soft center. Fresh herbs and olive oil give them loads of flavor but keep the calories lower than fried potatoes. 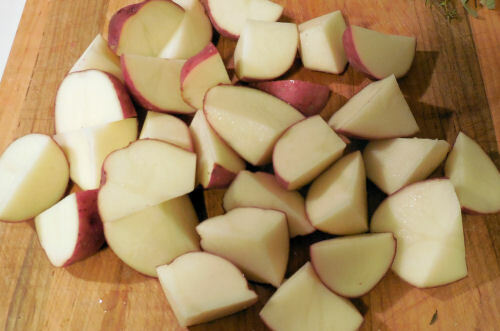 Cut the potatoes into large chunks and place in a large baking dish lined with aluminum foil. 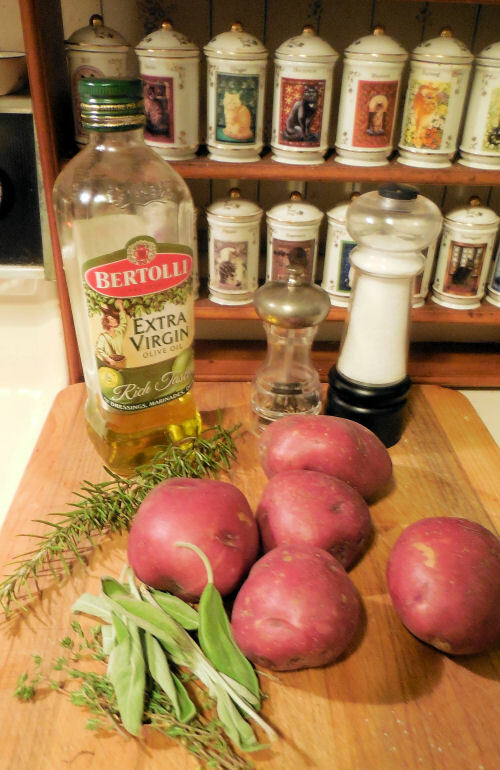 Dump the oil/herb mix into the potatoes and mix well using your hands. Serve immediately. Be careful, the insides are very hot!